The typical Molly (ecstasy) user in the U.S. is a Non-Hispanic White male, who’s an employed college graduate, lives in a large metro area, and has an annual family income under $40,000. Find out more statistics in this infographic. While use of Molly (ecstasy) among adolescents aged 12 – 17 has declined in recent years, use rates remains steady among adults. Still, over half a million adults surveyed in 2014 were current Molly users. Among people aged 12 or older in the same year, 0.2% used ecstasy. These percentages represent approximately 609,000 during that year who used ecstasy. 1.2% of adolescents have taken ecstasy at least once in their lifetime. 0.7% of adolescents have taken ecstasy in the year previous to the survey. 0.2% of 12-17 years olds reported using ecstasy within the month previous to being surveyed. 12% of young adults reported using ecstasy at least one time in their lives. 3.5% of 18-25 years olds reported using the ecstasy within the previous year. 1% of young adults aged 18-25 had used ecstasy within the past 30 days preceding the survey. 6.4% of adults aged 26+ reported using the drug at least once in their life. 0.5% of 26+ years olds reported using ecstasy within the previous year. 0.1% of adults aged 26 or older reported ecstasy use within the last 30 days before being surveyed. Molly use is dangerous for your physical and mental health. In 2011, ecstasy use was involved in an estimated 22,498 emergency department (ED) visits, the majority of which occurred among individuals within the age bracket 18 – 29. ED visits that involve ecstasy have more than doubled since 2004.nReports show that males represent around 70% of total ecstasy-related ED visits. Do you like our infographic and the information it contains? Please feel free to share it and spread knowledge. If you have any additional questions about the use and addiction to Molly (ecstasy) or would like to share your personal input, we welcome you to post in the comments section below. We value your feedback and try to provide personal and prompt response to all legitimate inquiries. This says nothing about molly addicition (which is almost non-existent due to it not working if used too often) what is the point of this post? Hi Mike. 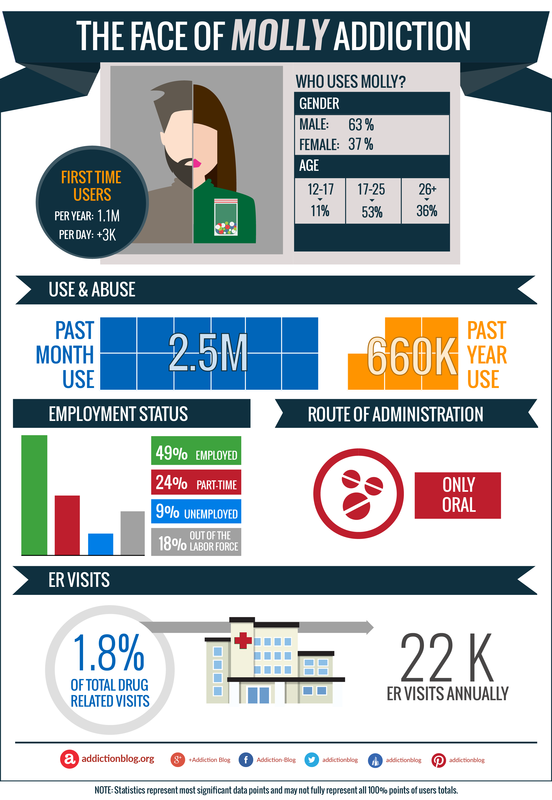 This infographic is made of governmental sources that show real statistics of people who seek help for ecstasy addiction. Ecstasy addiction exists.